Belgium’s national team, which finished third during this summer’s World Cup, will play Switzerland tonight for the European ‘Nations Cup.’ Although star players like Hazard, Lukaku, and Courtois would rather be asked about their own performances, journalist mostly wants to know what they think about the darkest scandal ever to hit Belgian soccer. Two days ago, police raided the offices of 8 major soccer clubs, arrested a trainer (of Club Brugge, which plays in the Champions League), 2 player managers and 2 referees. 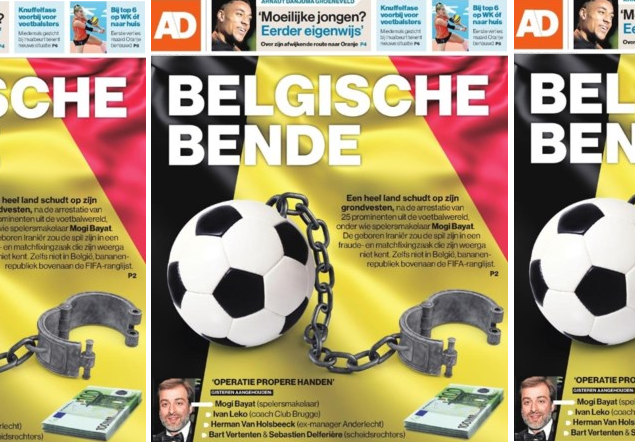 After several press briefings, it is becoming clear that the judiciary has opened a wide investigation into Belgian soccer practices which shows involvement in corruption, money laundering, and match-fixing. Supporters are furious as the rest of European soccer fans look on in amazement. The face plastered across all European sports newspapers (L’Equipe in France, Marca in Spain and Gazzetta Dello Sport in Italy) was that of Club Brugge trainer Mr. Ivan Leko who spent 1 night in jail. Mr. Leko’s team plays against Dortmund (Germany) and Valencia (Spain) in the UEFA Champions League this season and all focus will remain squarely on him. He is currently suspected of money laundering. A second team in serious trouble is the old European great KV Mechelen, which won a UEFA title back in the 1980s. They have recently been relegated to the second division, but it would now appear several of their board members had approached players of other teams as well as two referees to try and arrange matches so they could say in first division last season. In fact, as European soccer fans know (a similar scandal took place in Italy in the 2000s), in order to fix a match in soccer, all you need to do is approach 4 of the 23 people on the field (11 per team + 1 referee). You pay two defenders and the goalkeeper of the opposing team to make fouls on your players and let in an easy goal and pay the referee to whistle some suspicious penalties. There are currently 4 matches of last year’s competition which appear to have been fixed. The Belgian judiciary has decided as of this morning to stop the second division’s competition until further investigation can determine what needs to be done. Rumors are Brugge would replace their trainer if he is found guilty and Mechelen would either be dropped to a lower division of the authorities would scrap the club from the register altogether.